Ocean climate extremes have received little treatment in the literature, aside from coastal sea level and temperatures affecting coral bleaching. Further, it is notable that extremes (e.g., temperature and precipitation) are typically not well represented in global climate models. Here, the authors improve dynamically downscaled ocean climate model estimates of sea surface temperature (SST) extremes in the Tasman Sea off southeastern Australia using satellite remotely sensed observed extreme SSTs and the simulated marine climate of the 1990s. This is achieved using a Bayesian hierarchical model in which the parameters of an extreme value distribution are modeled by linear regression onto the key marine climate variables (e.g., mean SST, SST variance, etc.). The authors then apply this fitted model, essentially a form of bias correction, to the marine climate projections for the 2060s under an A1B emissions scenario. They show that the extreme SSTs are projected to increase in the Tasman Sea in a nonuniform way. The 50-yr return period extreme SSTs are projected to increase by up to 2癈 over the entire domain and by up to 4癈 in a hotspot located in the central western portion of the Tasman Sea, centered at a latitude ~500 km farther south than the projected change in mean SST. 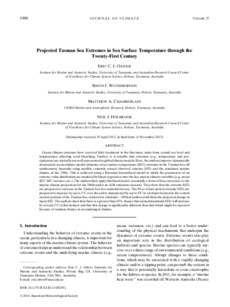 The authors show that there is a greater than 50% chance that annual maximum SSTs will increase by at least 2癈 in this hotspot and that this change is significantly different than that which might be expected because of random chance in an unchanged climate.